Newly arrived Syrian refugee Elo Manushian, right, is united with her granddaughter Rita Mahserjian, left, in Toronto on Dec. 11, 2015. 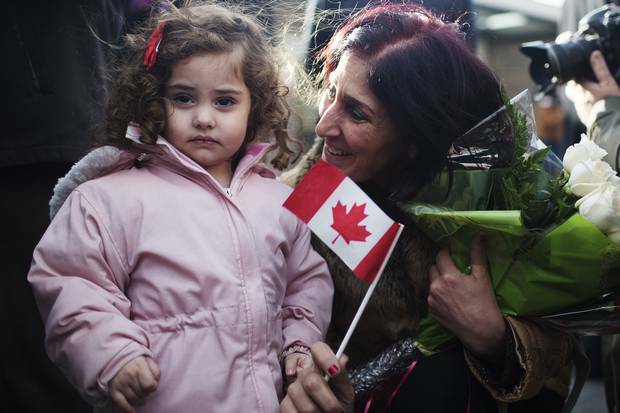 Canada began welcoming Syrian refugees in larger numbers last December, after the newly elected federal Liberal government declared that its promise to resettle 25,000 Syrian refugees by the new year would be a "national project." It was a massive undertaking that mobilized thousands of citizens and civil servants on a scale unseen since the Indochinese boatlift of 1979-80. The government couldn't meet its timeline, but it did meet the target of 25,000 refugees by the end of February, 2016. The new arrivals were greeted with much fanfare, including a smiling Prime Minister Justin Trudeau welcoming the first planeload at Toronto's Pearson Airport on Dec. 10 with winter coats. But the transition was not always smooth, as some refugees were forced to spend long stretches in hotels, large families struggled to find apartments to accommodate them and some found it difficult to get access to language classes. Across the country, Syrians have arrived in new neighbourhoods and schools and, as with so many waves of immigrants before them, both the refugees and the communities that receive them will be changed by the experience. As Canada marks the first year of this initiative, we take a closer look at Syrian refugees through the demographic data. The initial surge of arrivals was fuelled primarily by privately sponsored refugees whose applications were already in the pipeline under the previous Conservative government. Many of them have family ties in Canada and their first year is subsidized by their sponsor group. In Quebec, where roughly half of Syrian-Canadians were believed to reside, about 80 per cent of Syrian arrivals were privately sponsored. By contrast, in Saskatchewan, only a very few have been privately sponsored and the overwhelming majority are government sponsored. In the first years after arrival, privately sponsored refugees, who often have advantageous family networks and higher levels of education, tend to fare better economically, studies have shown. Government-sponsored refugees are typically selected based on humanitarian need, which will often present social and educational challenges and they tend to take longer to establish themselves. Ontario and Quebec, Canada's two largest provinces, took in the largest number of refugees. Alberta, where there are established networks of private sponsorship groups, including large organizations run by Catholic groups in Calgary and Edmonton, surged ahead of its larger neighbour British Columbia to take third spot. New Brunswick took in refugees at a rate far higher than its share of population, exceeding the numbers seen in more populous provinces such as Nova Scotia, Saskatchewan and Manitoba. Toronto, Montreal and Vancouver, Canada's three largest cities, are always magnets for immigrants, so it's no surprise that they would see the largest influx of Syrian refugees. All three have Syrian-Canadian residents who will have helped drive sponsorships. They also have effective refugee-sponsorship organizations, such as churches and secular groups, that provide an infrastructure for the new arrivals. On a per-capita basis, it was the mid-size Canadian cities that saw the greatest proportional impact of the Syrian refugee movement. Trois-Rivières, a Quebec city of 135,000 people, had the highest per-capita rate of arrivals. Janet Dench, executive director of the Canadian Council for Refugees, said there is a large and well-organized Armenian-Syrian community in Quebec that has contributed to sponsoring and settling a sizable number of the new arrivals. London, Ont., a city with a sizable Muslim community, welcomed the fourth-highest total, proportionally. 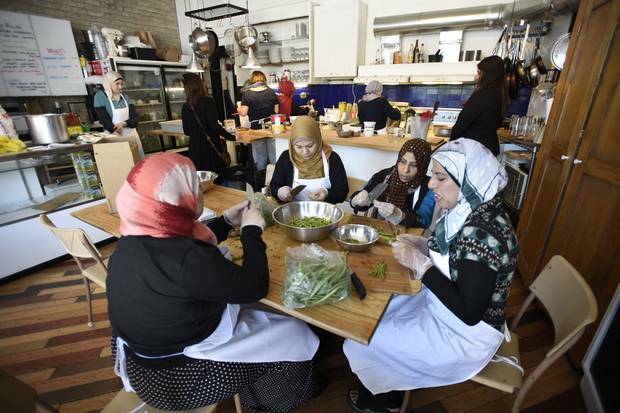 Members of the Syrian refugee community gather to prepare and cook traditional meals on June 9, 2016. One of the first hiccups in the process was the need to accommodate families that are larger than what is typical in Canada. More than 1,300 of the Syrian families consist of eight people or more and another 1,200 are families of seven. It's difficult, particularly in crowded big cities, to find rental accommodations that will suit such large numbers. "They were getting larger families than they expected," Ms. Dench said. "There had to be some adjustment." Many refugees at least initially had to be put up in hotel rooms and at times the density, and the need to divide families across more than one room, caused frustration for some families. The larger families tend to have arrived in the government-assisted category. The privately sponsored group make up the bulk of families of five or fewer members. About 20 per cent of families, the largest group, have four members and they're roughly equally divided between private and government sponsored. As with any refugee population, there is a broad range of educational attainment, from less than high school to postgraduate completion. The largest group, more than half of all refugees, have completed high school or less and there is a substantial chunk, nearly a third of the population, for whom the education level is not stated. Keep in mind, though, that almost half of the Syrian refugees are under 18 and are still too young to have attained much educationally. Many of the children had their education interrupted by the conflict. About 7 per cent of the refugees have a university degree. "People getting sponsored [privately] are more likely to be highly educated," Ms. Dench said. "We've heard quite a lot of people are illiterate and there are large gaps for some kids who haven't been to school." The Syrian refugee population is unusually young. Slightly fewer than 50 per cent are under 18 years of age, and they will likely benefit from having time to adjust to Canada in the public school system, where language instruction and social integration are primary goals. Surprisingly, there are slightly more males than females among the Syrian refugees. The Liberal government initially stated that single males were not going to be considered for processing because they presented a potential security risk, although they later softened their tone by saying gay males could be considered. Citizenship and Immigration Canada did not reply when asked how many single males had been admitted. The difference between genders is due mainly to a larger number of boys than girls in the cohort, as there are more women than men among ones over 18. Around the world, more boys are born than girls, at a rate that varies between countries, but is roughly 1.07 to 1.00 globally. Men also tend to die at younger ages. Quebec, where private sponsorships predominated, has the smallest proportion of under-18s at just 37.5 per cent, vastly different from the population in the rest of the country, which, once Quebec is excluded, is 56 per cent under 18. 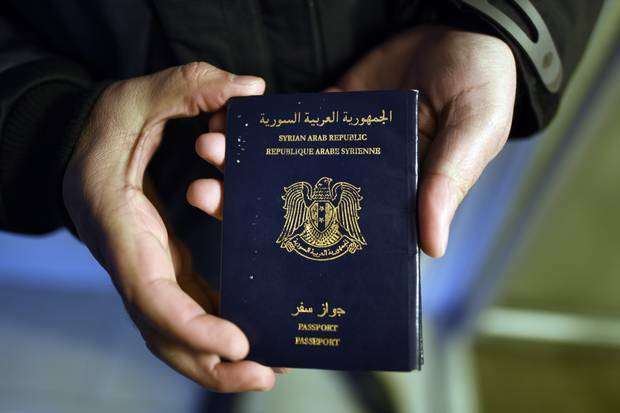 Narsis Bardakjian holds his Syrian passport while waiting to move into his new home in Canada on Dec. 23, 2015. The overwhelming majority describe Arabic or Syrian Arabic as their mother tongue. Arabic is a regional language, so Syrian Arabic is simply the regional variation. A smaller number cite Armenian or Kurdish, and many of those will have been among the privately sponsored refugees nominated by relatives in Canada. About one in three Syrians can speak some English, most of them part of the privately sponsored group. And more than 60 per cent don't speak either official language, a fact that will pose perhaps the most difficult integration challenge. Many have reported difficulty or long waits for language training, according to Ms. Dench, or a lack of child care even when classes are available. "It's hard to get work if you can't understand English or French," Ms. Dench said. As the one-year mark arrives, more and more Syrian refugees will be transitioning from public or private income support to full-time work and language ability will be a key component of that shift. 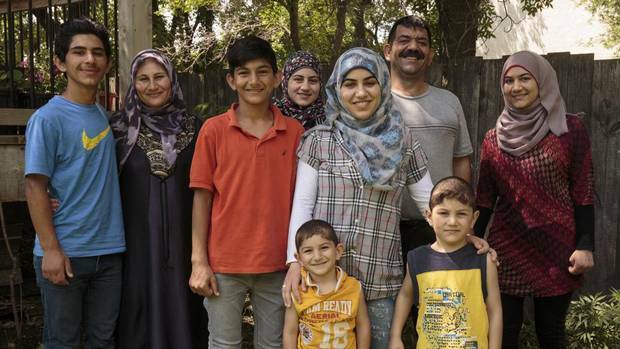 Editor's note: Since November, 2015, 35,147 Syrian refugees have arrived in Canada. An earlier digital version of this story gave an incorrect number. 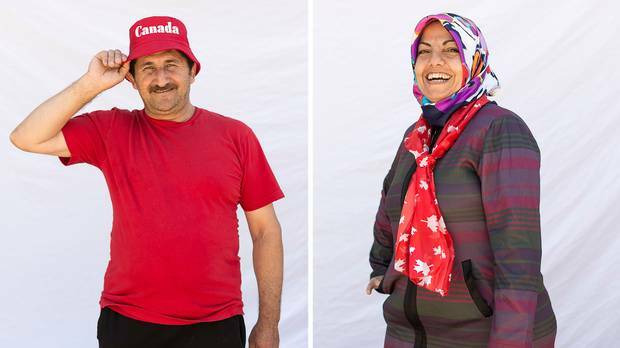 Refugees, sponsors and what it means to be Canadian Meeting families and those helping them flee the brutality, Ian Brown gains some insight into the true nature of Canada. Welcome to the country: Refugees are helping a prairie town grow In 2016, the small community of Altona, Man., opened its doors to five families of Syrian Muslims seeking a refuge of their own, Erin Anderssen reports.